Long time no see! My apologies; I have updated the look of my blog and personally have been trying to make some major changes, but I have a ton of new products and favorites lined up to discuss very soon. The theme of my skin this winter was dry, something that I am not at all used to with my normally combination/slightly oily skin. They dryness even seeped over to my poor hair (although to be fair it is normally somewhat dry) so by November I was furiously searching online for beauty products to protect and heal my slightly crunchy skin and hair. While Googling things like "can barely move face" and "food to promote sebum production", I came across The Beauty Detox Solution, a book on using nutrition to change the way you look, as well as how you feel. The author, Kimberly Snyder, is a well-known celebrity chef and a member of the National Association of Nutrition Professionals. What I loved most about this book is her ability to give direction to those of us who still eat meat (gasp, I know) as well as the vegans and raw foodies out there. I wouldn't necessarily be able follow all of the advice in the book, but I have made some changes to my supplements and diet that seem to be helping my skin remain more balanced and wrinkle-free; I even feel like my hair has benefited! For around $10 on Amazon, I think this is a great beauty reference book to keep on hand. Another winter-beauty favorite is Aquaphor Healing Ointment. This is a product that I've heard many in the beauty industry recommend but for some reason never picked up. My cracking lips and elbows convinced me to try it in December though, and I will never be without this again. The main ingredient in Aquaphor is petroleum (more commonly referred to as Vaseline) which is known for locking moisture into skin and filling lipid gaps between cells to promote healing. Although I'm not quite there yet, several women in their 40s-50s with gorgeous skin have admitted to me that they coat their face in this at night to avoid wrinkles. Maybe someday, but for now it has saved my lips, elbows and cuticles over the last few months. And then there is my hair. My poor, over-processed hair. My hair is sad enough on it's own, but dry weather makes it even sadder. A client actually recommended Viviscal to me last summer when I complained about the constant breakage I was experiencing, but the idea of spending $49.99 on a month's worth of anything seemed slightly crazy to me. After reading numerous positive reviews on the product, I finally caved a few months ago and bought it, resulting in one of the best decisions I made in 2011. 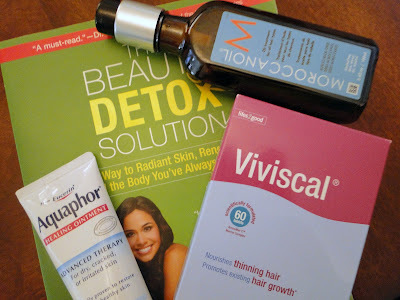 My hair has not only grown much faster since I began using Viviscal, it also feels considerably better. It no longer sounds like twigs snapping while I brush it, which to me is worth hefty price tag. I also started using Moroccan Oil on my hair at night, actually rubbing it into my dry hair and then rinsing it out in the morning. Although I'm aware of how sick many people are of hearing about Moroccan Oil, my hair is much smoother and easier to manage since I have been doing this several times a week. My experience with these new-to-me products during cold, wintry weather was so great that I definitely think they are things I'll be purchasing again to keep on hand, just in case. Viviscal especially is worth a try for anyone dealing with extremely damaged hair or hair that is thinning. I am glad you got the Beauty Detox Solution. It helped me so much, as well. And I adore the viviscal tabs as well !! I'm looking up Beauty Detox Solution! And, I'm so happy to hear Viviscal is working for you! I'm still in my first month of using it.